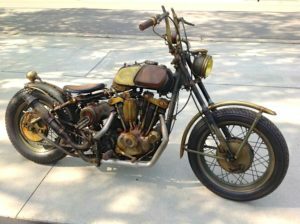 Tony Cochran Archives - HGR Inc. When did your interest in art begin? My interest in art began the day I figured out that drawing was more fun than math. It was probably back in grade school. I was pretty good at it, so you follow the praise. Where have you worked, and what have you done in prior career roles? In high school and college I worked in retail — stockrooms, loading docks. After Columbus College of Art & Design, I got a job at a dealership in an auto body shop. That’s where I stayed 15 years sneaking to do artwork under the quarter panels of cars I was repairing. I’d do paintings in the evenings in the basement next to the laundry when I got home from work. Vickie, my wife, networked with galleries and art collectors after her day job as an occupational therapist. She encouraged me to pursue my art career full time. The sudden death of a friend of mine made me realize life is short, and I quit the auto body shop to pursue my muse. We rented a studio in an old casket building, and I painted away. Tell us about the comic strip that you do and how it came about. My comic strip is about a long-footed little girl name Agnes. She started showing up in the margins of my sketchbooks as I pursued my painting. I never planned to make my living as a syndicated cartoonist. It found me. Agnes is being raised in a small house trailer by her Grandma. Her best friend is Trout. She is published in newspapers in the USA, worldwide, and all over the Web. Search “Agnes comic strip.” You won’t be disappointed! Tell us about the guitars that you make and why you became interested in making guitars. The guitars came from a style I was trying out on a motorcycle, but I wanted to explore it further and motorcycles take up too much room. My brother brought me a spare electric guitar he had up in Buffalo, and I ran with it. Electric-guitar styles have a heavy hot-rod ethic to them. My guitars have been called steampunk, but that’s not quite right. I like them to look old. I like them to confound. I like to add stories about them and help them along in their historical journey. They have unusual finishes — odd gizmos — and are completely functional guitars, as they should be! Functional art. I won’t modify a classic guitar. There are too few of them, and they should be preserved for future generations to enjoy in a pristine state. When and why did you start the guitar business? We started the guitar business to supplement my lovely wife Vickie’s loss of income due to an unforeseen battle with breast cancer. Selling guitars, creating and running the website, working social media, and doing all the marvelous photography of these is something she did beautifully, and with grace and huge success, all the time recovering her health with mastectomies and chemo. I just create and build the things. 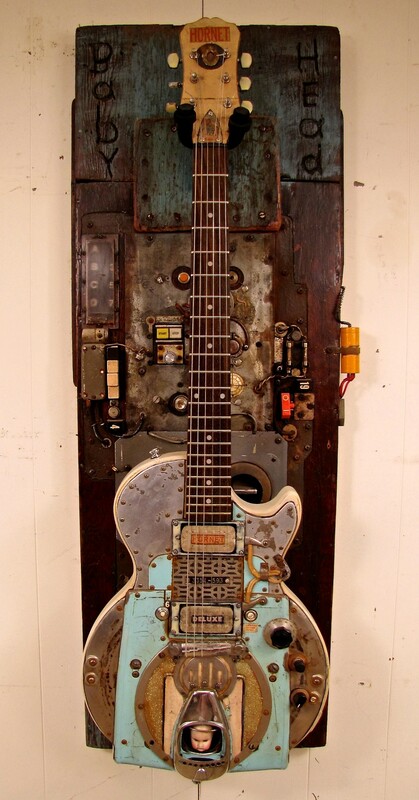 Where do you get your reclaimed materials and wood for your guitars? I find my mechanical palette everywhere. Garage sales, rummage sales, attics, basements. I have been known to send Vickie out of the car at stoplights to fetch odd bits of metal out of the gutter. I cut stuff up, rearrange it, beat it with hammers, weld it, melt it, rust it with acid. Materials need to be scaled to fit the guitars. People find me things, send me items. I am a receptacle for the weird. Feel free to throw something in! I am privileged to have fans and buyers of diverse talents and visual desires. They love guitars, they love art, and want to own something a little outside of the box. I have an international market of art collectors, musicians, music producers, pop stars, you name them. What fun! 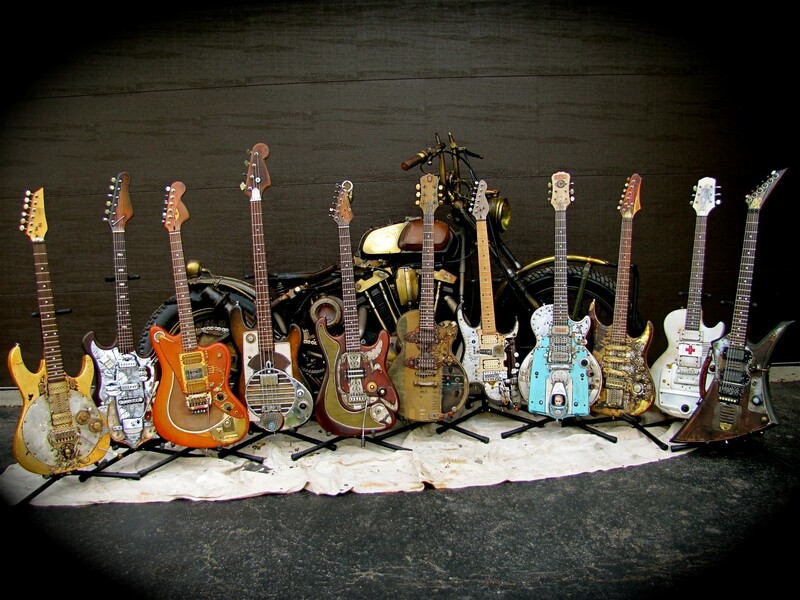 Our customers are a wide cross section of guitar and art collectors. Guitar people seduced by the seductive imagery, lovers of the quirky, appreciators of the arts. I remember bragging to my brother when Rick Springfield bought three and uses them on tour on four of his CD covers. My brother said, “Well, he’s not really a guitar player.” Brothers! Sheesh. What else have you made? I’m working on another Harley right now. I converted it to a trike and am making it look like I found it abandoned in the desert, a 60s custom vibe abandoned to time and the elements. What do you do when you aren’t drawing the strip or making guitars? Other than all the activities of daily living like house maintenance, laundry, lawn mowing, oil changes, cooking, visiting people, reading, and fixing everything around here that breaks? Nothing much. Vickie and I have been together since we were 16 years old and high school sweethearts, and we continue to spend all the time we can together. My personal philosophy is to get everything finished. If you die, well, you’re finished. What advice do you have for other artists/makers? Have fun, but you can do better than the last things you did. Anything I missed that you wanted to mention? I’ve started complimenting all new builds with an art display assemblage that the guitar is shown on. There are three art elements: the art display assemblage that stands alone as art on the wall and has the guitar mount incorporated in it, the guitar itself, and the combination of the two. I’m saving them for a single show and have only let people see “The Baby Head” whose photo is below. It was sold immediately to a major guitar and art collector who saw the preview. They will knock your eyeballs clear out! I’d love to show them in Cleveland. Upscale gallery? Cool tavern? Rock Hall? Take a look at my work at www.TonyCochranGuitars.com and contact me at tony@TonyCochranGuitars.com . Ready for a show?